It’s interesting to see a painting by Monet that includes human figures. (You can see a figure study for this painting here.) I’m so used to seeing Monet paintings with haystacks and Rouen Cathedrals and water lilies and train stations – it’s so nice to see something different. You also might have noticed that this painting was made just about two years after Manet completed his painting with the same title. A coincidence? Definitely not. There’s no question that Monet was influenced by Manet. So, what do you think? Did you know that Monet painted a Déjeuner sur L’Herbe? (I really hope that I’m not the only one who was unaware of that fact.) Which version of the subject matter do you like the best? Devéria and the Lion King? Here’s my latest art historical hunch. Take a look at the two images below. 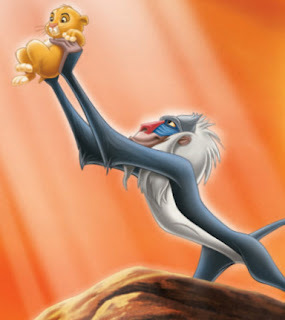 Does anyone else think that the opening scene of Disney’s cartoon “The Lion King” (1994) was influenced by Eugène Devéria’s Birth of Henry IV (1827)? My favorite thing about this painting: the awesome rainbow wings on the angel Gabriel. I also love the that Gothic and Renaissance references are combined in the same architectural setting, references the Old and New Testament. I particularly love the hand on the right which covers up a candle. Sigh – tenebristic lighting is awesome. I also love the adoring expression of the man on the right. You HAVE to click on the image above to see all of the details in this painting. I saw Nativity a few years ago, soon after it was completed. This painting is HUGE (about 7′ x 17′), and the viewer can’t help but feel swept into the swarm of angels that swoop around the Holy Family. It’s quite moving. Do you have a favorite piece of Christmas art? Mom liked Hunt’s art because it was highly religious and moralistic. She liked The Awakening Conscience because it explored the theme of redemption. 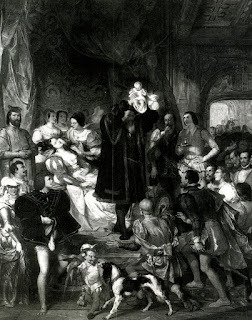 This painting depicts a prostitute or mistress who is sitting on the lap of her lover. They are playing the piano together, and it appears the lyrics of the song have pricked the conscience of the young woman. The painting captures this woman’s precise moment of enlightenment and realization. I especially like looking at her expression and knowing that she is staring out an open window (which you can see reflected behind her in a mirror). - Music on the floor: “Tears, Idle Tears” is Edward Lear’s musical adaption of Tennyson’s poem. The sad poem seems to express sorrow over the woman’s predicament. (You can read the poem here). - Hat and glove: The clothing objects are hastily cast aside, which indicates an abandonment of decorum. Because the hat is placed on the table, it shows that this man is a visitor and not a permanent resident in the house. - Unraveled threads: A reference to the woman’s wasted life. - Cat and bird: The cat is chasing a small bird underneath the table. This vignette is a reference to the woman’s predicament (the man = the cat, the woman = the bird). - Light on the floor: Suggests enlightenment and potential redemption for the woman. I especially like the inclusion of the cat and bird. Is there any specific object that you like? The Awakening Conscience will forever remind me of my mother. Did a friend or relative ever introduce you to a work of art? Do you remember the experience? Look closely at this photograph – can you see the man who blends into the background? 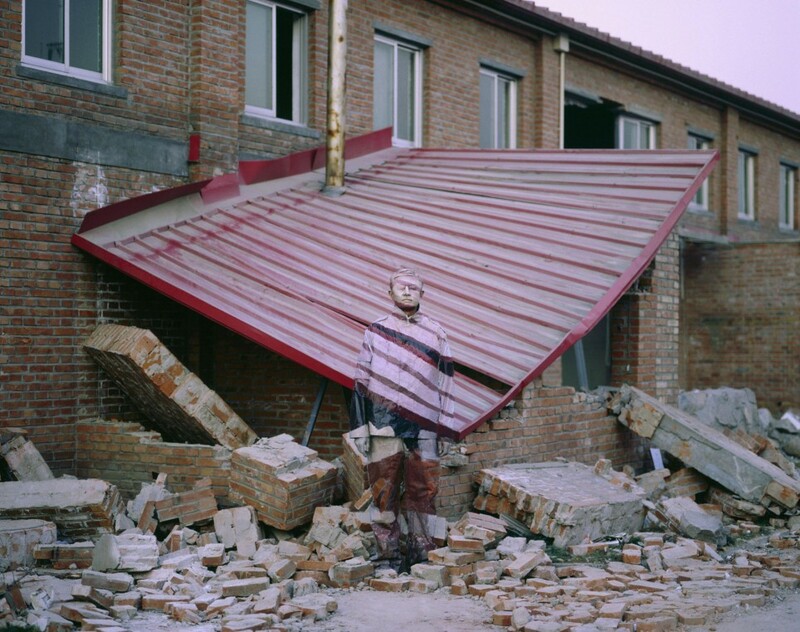 That man is the artist Liu Bolin. He paints himself to “hide” within his photographs. I just watched this interesting newsclip about Bolin and his work. I think it’s pretty creative stuff. You can read more about the ideology that underlies Bolin’s art (and see more pictures of his work) in this article. I like how these photographs emphasize the idea that a person is affected by his/her surroundings. I latch onto that idea more than any of the political ideas that influence Bolin, although I think that his artistic/political protest makes sense.